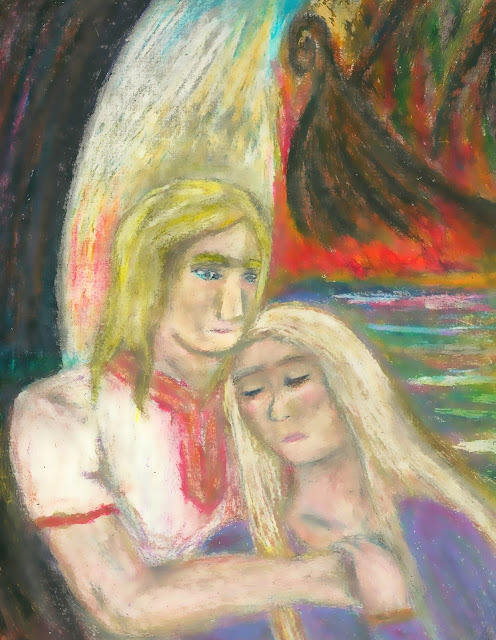 A new devotional piece in pastels, with some color-balancing via my preferred art software. The contrasting black and white background symbolizes Their passing through Hela's realm. I've been in a "Slavic" sort of mood lately. Balder's shirt design reflects this. Creative Commons Copyright: Attribution-NonCommercial-ShareAlike (CC BY-NC-SA). Thank you very much. By all means, please feel free to use the artwork on your blog. It is under a Creative Commons license, so non-commercial use is fine.